A basic book that addresses more than five hundred common cooking problems, The Cook’s Problem Solver is organized to help chefs find solutions to cooking problems quickly and easily. Learn simple tricks to avoid dry biscuits, thin custards, soggy cakes, sticky rice, wilted lettuce, and curdled cream soups. Breads, cakes, and puddings will come out right every time whether they're made in a conventional or microwave oven. Biscotti, wafers, kilfli, rugelach, shortbreads, and florentines are included in this expansive celebration of the downright bliss of butter, sugar, chocolate, peanut butter, nuts, fruit, and spice in all their wonderful combinations. Grab a glass of milk and get ready to enjoy the old favorites and new classics in this true tribute to the art of the crumbly, crunchy, ooey-gooey cookie. Marilyn Harris, hailed by Bert Greene as “the undisputed doyenne of cuisine in the Midwest,” brings you Cooking with Marilyn, a collection of recipes and suggested menus for “real” food with an emphasis on simplicity of preparation. Hardcover. The restaurant’s second cookbook is an invitation into a family experience. Anthony and Gail’s son, John, shares his parents’ lives through recipes, anecdotes, photos, and letters of support they received after Hurricane Katrina. 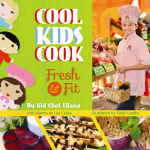 Everyone benefits from healthy menus, and Kid Chef Eliana has created a collection of twenty-six recipes that focus on flavor and fresh ingredients. Her recipes are easy to prepare and kid-friendly. With mouth-watering dishes, including such tasty treats as Vinegar and Sea Salt Kale Chips, Beef and Broccoli Stir-Fry, and Inside-Out Peach Crumble, the whole family will be eating nutritious meals prepared by their very own kids! 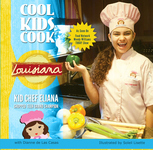 Kid Chef Eliana keeps the good times rolling in this kid-friendly cookbook of Louisiana cuisine. With nearly thirty exciting recipes from meat pies to boudin balls to Mardi Gras king cake, Eliana undertakes a culinary journey exploring unique gastronomic traditions from all regions of the state. With Eliana’s help, your delicious dishes are sure to satisfy the taste buds of all ages! Between slaying nutria for a Mardi Gras celebration, lying in wait for mallards in Venice, or fighting off a wild hog, these Cajun boys know their way around Louisiana’s bayous. This delicious compilation is cooked with a roux of raconteur Howard Mitcham’s wit and served with a side dish of jazz history and lyrics. As an appetizer, Mitcham traces the development of the cuisine that made New Orleans famous and the history of the people who brought their native cookery to the melting pot that makes New Orleans a living gumbo. Paperback. 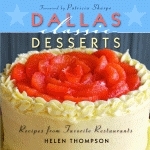 Highlighting iconic Dallas dishes and the confections made famous by the city’s favorite restaurants, Dallas Classic Desserts shares the secrets behind such indulgences as Fearing’s Caramelized Apple Fritters and Al Biernat’s Texas Pecan Pie à la Mode.